Recent White House statements that U.S. troops should stay in Syria to contain or counter Iran are getting push back from lawmakers who say that’s not constitutional without a new congressional vote of approval. Military officials testifying on Capitol Hill said using American troops to counter Iran would mark a fundamentally new mission compared to the current counter-terrorism one targeting Islamic State militants. The new tension between Congress and the Pentagon comes after National Security Adviser John Bolton said Monday: “We’re not going to leave [Syria] as long as Iranian troops are outside Iranian borders, and that includes Iranian proxies and militias." Two Pentagon officials sat before the House Armed Services Committee Wednesday where they were questioned by a bipartisan group on the Oversight and Investigations Subcommittee. Questions from Massachusetts Rep. Seth Moulton, a prior Marine Corps infantry officer and the ranking member, particularly stood out. To Moulton, that still requires a congressional authorization under the Constitution’s War Powers Clause. “I would defer to the lawyers as to the precise mechanics,” Robert Karem, the assistant defense secretary of international security affairs, said in response. Karem and Benedict cited Iran’s proliferation of advanced conventional weapons and funding for Shia militias as reasons to counter its influence in the region. A display of captured Iranian weapons exports can be viewed at Joint Base Anacostia-Bolling in Washington and Karem urged members of Congress to visit the set-up. “Our presence in certain places can constrain Iran’s freedom of maneuver, it can empower our diplomats to put more pressure on Iran, but our purpose in being there and our military operations are not being conducted against Iran,” Karem said. “Well, the national security adviser has given you different guidance, and if that’s what the troops are hearing ... and you’ve already said that’s illegal under the authorization given from Congress, then I think the administration has got a big problem,” Moulton said. The U.S. presence in Syria is situated close to Jordan near At Tanf, in Syria’s north at Manbij, along the country’s border with Iraq near Al Qaim and Abu Kamal, and in other portions of Syria’s northeast, where the U.S. military partners with the Syrian Democratic Forces, Benedict said. 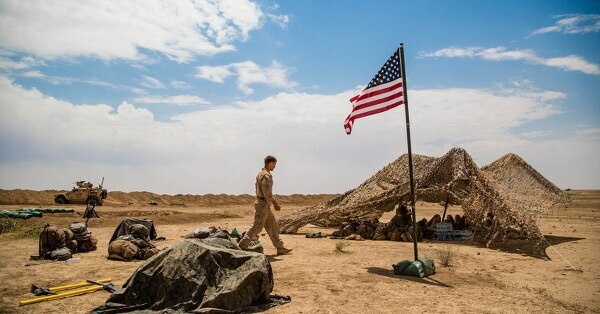 The U.S. military is currently operating under two Authorizations for the Use of Military Force, or AUMFs: one against al-Qaida and its affiliates, which ISIS falls under, and one against Iraq, from 2001 and 2002, respectively. Karem, though, warned against the precedence of abandoning U.S. allies in the country, such as the Kurds, and said that the U.S. government does not intend to create any independent countries.